Over 10% of patients are misidentified during health record searches, of which 6% will suffer an adverse medical event. 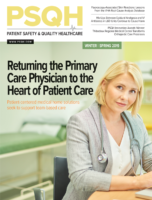 Patient misidentification is on the rise and can lead to medical errors, patient harm, and costly inefficiencies for provider organizations. Furthermore, many organizations rely on Medicare identification cards, which contain social security numbers, to identify patients, while the recent MACRA act requires the removal of SSN numbers from Medicare cards in the future. BLR®—Business & Legal Resources | Copyright © 2017 HCPro. All rights reserved.